Middlesex alumna Maddie Gatabaki has written and directed a film to promote BME (Black Minority Ethnic) donors, after losing a close friend to leukaemia. 24-year-old Kevin Kararwa lost his fight to leukaemia in May 2014, just weeks after launching his own campaign to encourage people of African and Caribbean heritage to join the UK Bone Marrow Registry. Since his death Maddie, now a freelance film director, has worked tirelessly to continue Kevin's campaign, and approached the African-Caribbean Leukaemia Trust (ACLT) about making a film to help spread their message. The short but powerful video entitled 'Could you be my match?' was released on 2 March this year and features two young men, John and Phil, who are both looking for their 'perfect match'. While the two men talk about their 'perfect match' the audience are led to believe they are describing a partner, before it later transpires that they are referring to life-saving donors. The events that then unfold in the video highlight the devastatingly low number of BME donors in the UK, versus the number of White British donors. Maddie said: "Kevin asked me to use my film studies degree to create a short film which raised awareness on the fact that there were 30 times more White people than black people on the UK stem cell register. He wanted to inspire 2,400 people to join it (100 people for each year of his life) and to raise £24,000 for ACLT, the charity who were supporting his mother, brother and him throughout his treatment and during the final weeks of his life." The film was released just two weeks before ACLT held their flagship drive on 14 March to try and get a record number of BME donors on the register. 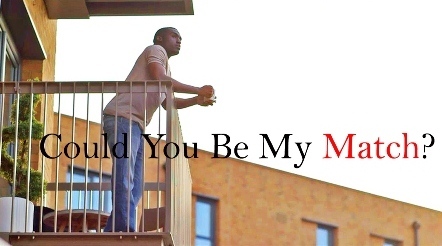 'Could you be my match' has received widespread interest among the press, with interviews across the BBC, London Live and Arise News. Many businesses also came out in support of the cause, with Barratt London offering up their showroom for use in the film, and Tower Bridge Studios and Cherryduck donating film equipment. Maddie's next project as a freelance director is scheduled to be a short film called `Innocence', designed to raise awareness of the sexualised culture that children are living in today. For more information on ACLT, visit www.aclt.org or call 0203 757 7700.